Spinal Disc Degeneration is something we see every day. This is because, while intervertebral disc degeneration and spinal arthritis does not necessarily equate to back pain, they can be part of the contributing factors that cause back pain. It stands to reason that in a facility that treats the spine we would see a large amount of patients with disc degeneration. Today, April 23 2014 I found a paper titled, Why do some intervertebral discs degenerate, when others (in the same spine) do not. I found this paper a bit funny because it answers a question that should be obviously clear for those of us who treat the spine. Disc degeneration and spinal arthritis occurs in areas of the spine under an increase amount of load that is greater than that part of the spine is created to tolerate. From the front our spine should be straight and from the side there should be several curves. These curves are measurable and evidence in published papers have found an ideal normal value with an acceptable normal range. Any deviation from a straight spine from the front or alteration of the normal curves from the side results in increased loading along the spine and some areas usually undergo increased loading over others. 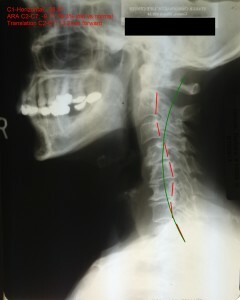 Let’s look at the radiograph of a neck to illustrate this. Our necks should have a C-shaped curve as illustrated by the green curved line, in the neck below the curve is reserved in the mid neck. You can clearly see the joint spaces above the mid neck look rather healthy and so does C7/T1 which is just below the reversed curve but where the curve is reversed there is severe disc degeneration and arthritis. Disc degeneration is seen as a loss of disc space on radiographs and arthritis can be best described as jagged lines along the margins of the joints. In the case below, the area of the greatest amount of disc degeneration and arthritis is where there is also the greatest amount of abnormal joint loading. Almost every older patient we see expects us to find some arthritis in their spine because the average person thinks arthritis is a condition of aging. This is only partially true, we know that arthritis and disc degeneration require increased loading but they also require time and the longer there is increased loading on a joint the worse the condition will be. If you wait until you are 70 to have some joint aches and pains looked at and have never done anything to make them better then yes, we probably will find arthritis in your joints. But, if you are mindful of the signals your body sends to you and at the first sign of pain in a joint and you get it looked at and you modify your life to improve the function of that joint, it is possible to not only get rid of the pain but you may also reduce the chance of that joint becoming arthritic. This includes the joints of the spine. In the above case, if this patient came to us first at age 30 instead of 66 we could have improved the curve in her neck and reduced the likelihood of that mid neck developing arthritis and disc degeneration. If you are wondering how we could have improved that curve I have a simple answer, exercise and traction. In this patient’s case we would have done stretching exercises to improve neck, shoulder, and upper back mobility and included strengthening exercises to stabilize and support her spine. We would have followed up with traction aimed at pulling that curve mid neck forward into the normal green line. If you doubt that can be done check our results page to see a few pre and post treatment radiographs. In her current state we can still improve her neck curve but the trouble is after decades of arthritis and disc degeneration slowly reducing joint mobility there is no way we could get her 100% back to normal. The picture below represents the type of traction we would do for a neck that looks like the above picture. Yes, disc desperation and arthritis are influenced by increased loading across a joint surface. You can avoid it by taking care of yourself which requires diligent, daily work. If you have symptoms related to disc degeneration give us a call because we are experts at managing spine complaints and we do it in a way that is unique to any other office in the area.